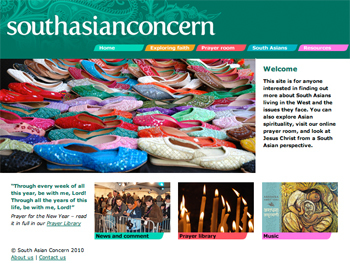 South Asian Concern is a Christian agency which provides spiritual resources and training to South Asians in the homeland countries of South Asia, and also in the diaspora communities around the world. They wanted to engage their audience in a new way by providing reading, prayer and discussion online, and this shaped the way we produced the website. I worked closely with South Asian Concern in developing the website’s structure and functionality, and also its look and feel. The work included a large amount of text editing and styling to ensure it works on web pages. We used Expression Engine in order to allow visitors to make comments on the content-rich pages, and also to give the agency’s in-house team control over the management of the site. The website was launched in January 2010.